This month sees the 90th Anniversary of the first running of the 24 Heures du Mans or Le Mans 24 Hour race which is organised by the Automobile Club de l’Ouest and run on the Circuit de la Sarthe much of which today follows the same course as in 1923. In order to celebrate one of my favourate events in the international motorsports calender I will be posting 26 blogs that cover just a fraction of the Le Mans story, starting with the Aston Martin DBR 1 that coincidentally won the Le Mans 24 Hours in 1959, the year I was born. Today’s featured Aston Martin was the second of a run of five racing cars that were built to more or less the same design between between 1956 and 1959. 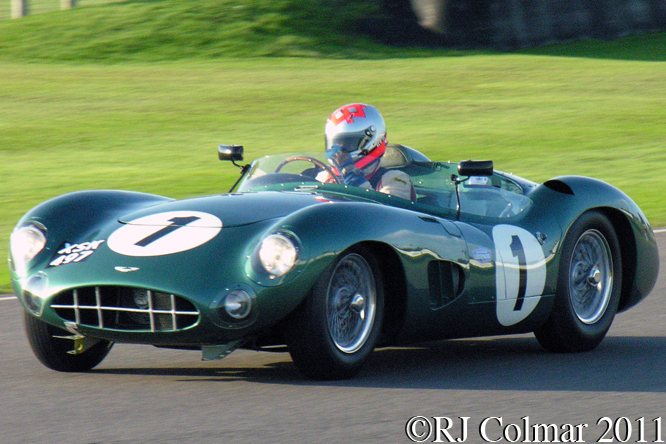 DBR1/2 was the first to be fitted with a 3 litre / 183 cui 6 cylinder motor from new in 1957. 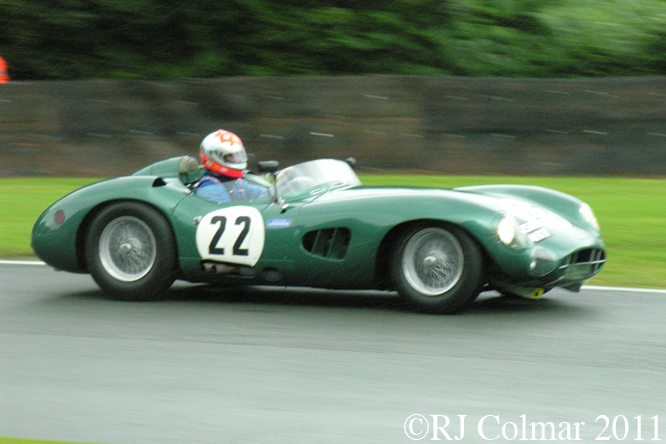 DBR 1/1 built in 1956 was orginally fitted with a 2.5 litre / 152 cui motor which was replaced in 1957. Tony Brooks and Noël Cunningham-Reid drove DBR1/2 to victory at the World Sports Car Championship round held at the Nurburgring in 1957 two weeks after Tony Brooks had led an Aston Martin 1-2 result driving the same car in the non championship race at Spa. Brooks and Cunningham-Reid shared DBR1/2 again at the 1957 Le Mans 24 hours which they did not finish after being involved in an accident. The same pairing shared DBR 1/2 at a second non championship race at Spa which they won. In 1958 Stirling Moss shared this car with Brooks at Sebring where they retired from the 12 hour race with an axle problem. Two more retirements followed at the Nurburgring and Le Mans but at the end of the ’58 season Brooks and Moss won the Tourist Trophy at Goodwood, where the car is seen above with Bobby Verdon-Roe at the wheel. In 1959 Stirling Moss won a minor race at Silverstone with the Aston before Roy Salvadori and Carrol Shelby took over the driving duties for the 1959 Le Mans 24 Hours to score the Marques only out right Le Mans victory having covered 323 laps one more than the second placed sister car, DBR 1/4 driven by Maurice Trintignant and Paul Frère. At the end of the year DBR1/2 was driven to victory by Salvadori and Shelby in the TT at Goodwood again which secured the World Sports Car Championship for Aston Martin. 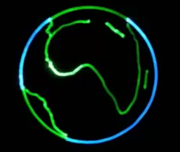 In 1960 Major I. B. Bailie acquired the car entering it for the 1000 km race at the Nurburgring where he came 22nd with Edward Greenhall and for the Le Mans 24 Hours with Jack Fairman sharing the driving the car finished it’s forth consecutive Le Mans 24 hour race in 9th place. Bailie scored further podium finishes with the car up to 1961. In 1963 David Ham acquired DBR1/2 and raced it on at least 2 occasions which netted podium results in class but no overall wins. Last year DBR1/2 which played a leading role in Aston Martin’s 1959 World Sportscar Championship success was offered for sale with an asking price of US$20 million. 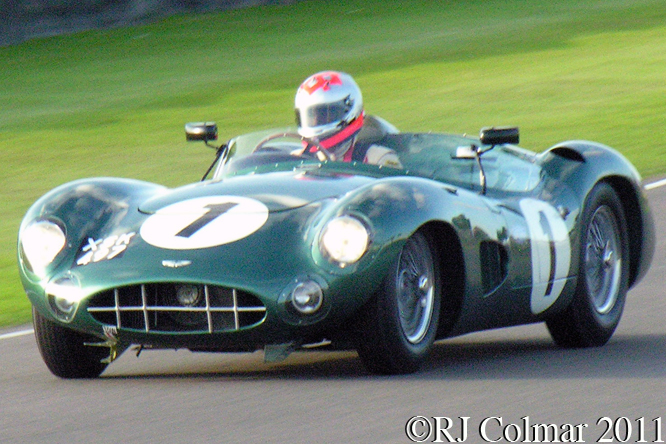 If DBR1/2 ever does change hands at that price it will become the most expensive Aston Martin ever. Thanks for joining me on this “$20m Winner” edition of “Gettin’ a li’l psycho on tyres”, I hope you will join me again tomorrow. Don’t forget to come back now ! This entry was posted in Uncategorized and tagged 24 Heures du Mans, Aston Martin DBR 1/2, Automobile Club de l'Ouest, Bailie, Brooks, Championship, Circuit de la Sarthe, Colmar, Cunningham-Reid, Fairman, GALPOT, Goodwood, Greenhall, Ham, Le Mans, Moss, Oulton, Park, Ralph, Salvadori, Shelby, Sportscar, Talacrest, TT, Verdon-Roe, World on June 1, 2013 by Ralph.